Witness Paris, City of Lights. Thanks to its attractive and easy-to-use shared bicycle program, it can boast itself as the City of Light Transport too. Commuter cycling in North America has long been overshadowed by the rise of the automobile and municipal transportation. When city planners sit down to contemplate their gridlock and air quality problems that mid-century planning has created, the bicycle typically enjoys something of an amuse-bouche notoriety—interesting, but seldom taken seriously. Well, not until recently. Some people credit the increase in bicycle sharing programs to Paris’ Vélib' bicycle sharing program, which launched commuter cycling in 2007 with great fanfare. It wasn’t the first city to have a bicycle sharing program, but its the largest program to date. Vélib’, a contraction of vélo (bicycle) and liberté (freedom) provides a network of 20,000 specially designed bicycles distributed among 1,450 stations throughout the city. 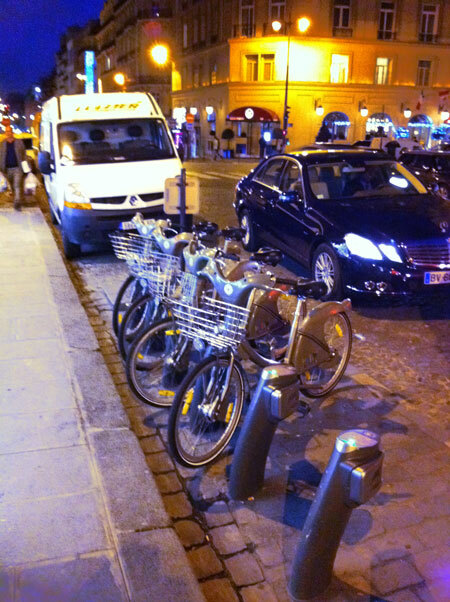 As an avid commuter cyclist in Vancouver, Vélib' was the ideal way to experience Paris. Among the five highest priorities of the City’s Green Transportation plan is the implementation of a public bicycle sharing program. To that end, in March 2009, Vancouver City Council approved a motion directing staff to explore opportunities to implement a PBS. Additionally, the City’s Greenest City Team identified the implementation of a public bicycle system as one of the eight GCAT Quick Start Actions (44 in total). Speaking with City Councillor Raymond Louie, I discovered that the City of Vancouver has just completed a two-year process and investigation to assess the needs for a bicycle sharing program in Vancouver. Back in April 2011, the City released a Request for Expressions of Interest (RFEOI) to invite applications from interested parties to develop, install, own, operate and finance a public bicycle system in Vancouver, for a targeted launch in spring 2012 or earlier. It is now soliciting a direct request for proposal (RFP) process looking for vendors to develop a business case proposal. The City’s 2012 First Quarter report is intended to indicate the quality of expressions from prospective bidders. The biggest obstacle to vendor’s implementing a bicycle share program is the Provincial helmet law, which came into effect province-wide in 1996 (part of the Motor Vehicle Act). Incidentally, fines in British Columbia for failing to comply top $100—the highest in the country. Naturally, the City has no intention of appealing the helmet law, so part of its request for proposals includes some way of meeting it. As Councillor Louie puts it, “we need to be lawful”, so most work-arounds include making loaner helmets available with the bicycles. The drawback here, of course, is hygiene. How would you feel about popping on a recently-used helmet on a hot summer’s day? Some form of disinfection of helmets or disposable liners is being considered, although the disposable liners will shoot the Green City Plan in the foot—perhaps re-usable liners that cyclist can purchase at a low cost. Let’s see what the proposals come up with. Councillor Louie described the advantages for visitors experiencing a city by bicycle enhances the experience of a city’s sites, sounds and smells “at ground level”. This certainly jibes with my experience of Paris—freedom and access were among the greatest advantages to using Velib’ in Paris. Tourism in Vancouver would certain benefit from such a program just as local transportation would benefit.